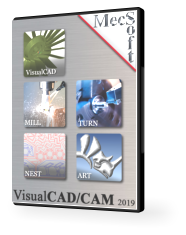 ART is a module within VisualCAD/CAM used to convert artwork into geometry suitable for machining. This plug-in introduces exciting new modeling techniques for modeling artistic shapes using raster bitmap images. Used in conjunction with VisualCAM’s 3D modeling tools, it offers a complementary set of modeling techniques for jewelry design, sign making and model making.